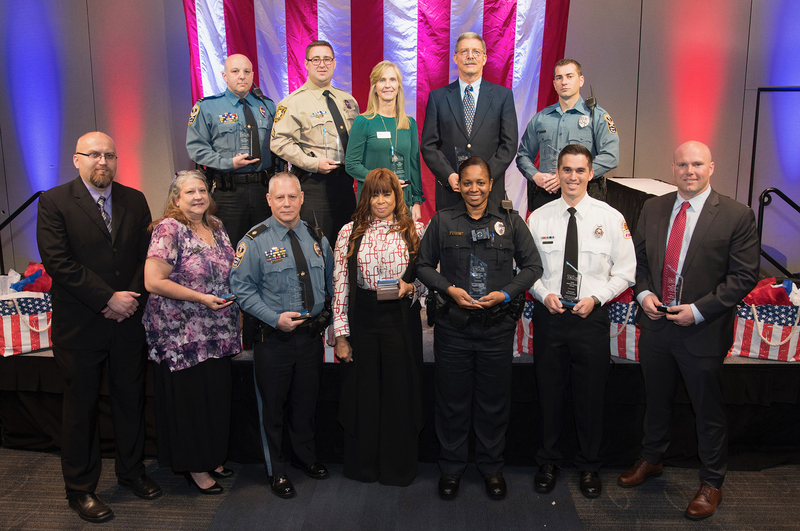 Local public servants received top honors for bravery and much-deserved praise at the 2019 Valor Awards on Tuesday, March 26, held at the Infinite Energy Forum. The event, hosted by Gwinnett Chamber and presented by Mobile Communications America and Motorola Solutions, honored the men and women who have performed heroic and extraordinary acts to protect and serve the citizens of Gwinnett. • Officers Antwan Toney and Ryan Walsh, with the Gwinnett County Police Department, were awarded the highest honor, the Gold Medal of Valor. The officers were dispatched to a suspicious vehicle call in Snellville, and as they arrived on scene, gunfire erupted from the suspect’s vehicle. Officer Toney’s heroic actions and absolute refusal to remain steadfast and not quit the fight helped ensure that Officer Walsh survived the encounter and that the suspects harmed no one else. Although Officer Toney ultimately lost his life, Officer Walsh’s immediate response during the incident greatly reduced the threat the suspects posed to other officers and citizens during the subsequent investigation and search. • School Resource Officer Nicolette McLeod received the Silver Medal of Valor for her response in the 8th grade hall at Trickum Middle School. She learned that a teacher had been stabbed by a student and the student was still in the classroom with the knife. Officer McLeod was able to de-escalate the situation by utilizing skills obtained through Crisis Intervention Team training, and the student was taken into custody. • Firefighter Trent Garrison, with the Gwinnett County Fire and Emergency Services, was awarded the Medal of Valor, Bronze, for his brave efforts after responding to a residential fire in Lilburn. Garrison quickly utilized his fire rescue training and did not hesitate about entering the deteriorating structure. Firemedic Garrison’s actions involved considerable personal risk and resulted in a life being saved that day due to his quick, selfless actions. • Gwinnett County Sheriff’s Office’s Corporal Jacob Baird received the Medal of Merit Award for his work with the Gwinnett Reentry Intervention Program as well as the jail’s Rapid Response Team and the Civil Emergency Unit. • Lieutenant Wes Barnhart, Police Officer Senior Patrick Crown and Police Officer Senior Richard Shelton received the Lifesaving Award for their rapid response and lifesaving actions to save a person entrapped in a car. • Public Safety Communications Officer of the Year was presented to Gwinnett County Communications’ COIV Pam McDaniel for her extraordinary poise and confidence throughout the tragic incident on October 20, 2018. • The Gwinnett Metro Task Force was awarded the Unit of the Year award for combating illegal narcotics, vice, gambling and assisting the participating agencies in investigations. The Gwinnett Metro Task Force is a multi-jurisdictional undercover task force comprised of municipalities within Gwinnett County. The team has assisted on a wide variety of cases outside the normal duties of a law enforcement officer. • Snellville Police Department’s Officer Brett Chism was awarded the Public Safety Person of the Year award for exceeding duty requirements and demonstrating a pattern of community service coupled with professional achievement. • This year’s Leadership honorees included Mindy Bayreuther and Dan Hansen. Assistant Chief Bayreuther retired from the Gwinnett County Police Department in March 2018 and is now the Chief, School Safety and Security for Buford City Schools. Retired Assistant Fire Chief Dan Hansen was recognized for his 43 years of public safety service to Gwinnett County. In the 14 years the Gwinnett Chamber has hosted the Valor Awards, this is only the third time the purple heart has been presented. The Purple Heart is presented to any public safety professional who has been critically injured or killed in the line of duty while performing their responsibilities at the scene of an emergency incident. 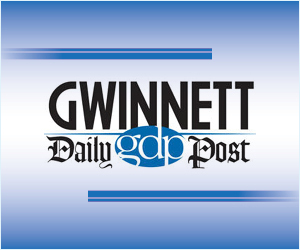 • Gwinnett County Police Department’s Officer Antwan Toney moved to Gwinnett and graduated from the police department’s 94th Academy on April 21, 2016. In the 3 short years that Toney lived in Gwinnett, he made an impact on our community with his smile, commitment to serve and his giving heart. For more information on the Valor Awards, visit www.ValorAwards.com.